Warm up Turn in Quiz Pick up a Vocabulary WS Make sure you have a protractor If your protractor does not have ruler, get a ruler Take out your notebook. 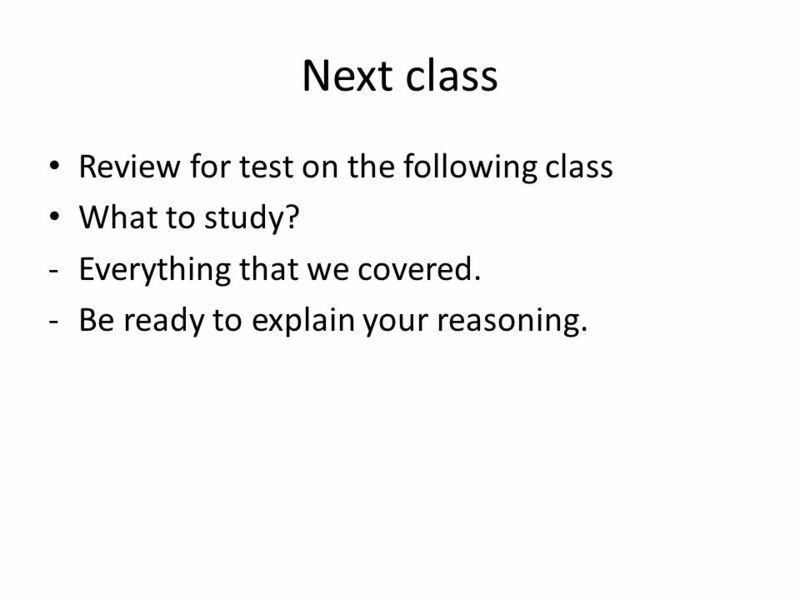 6 Next class Review for test on the following class What to study? -Everything that we covered. -Be ready to explain your reasoning. 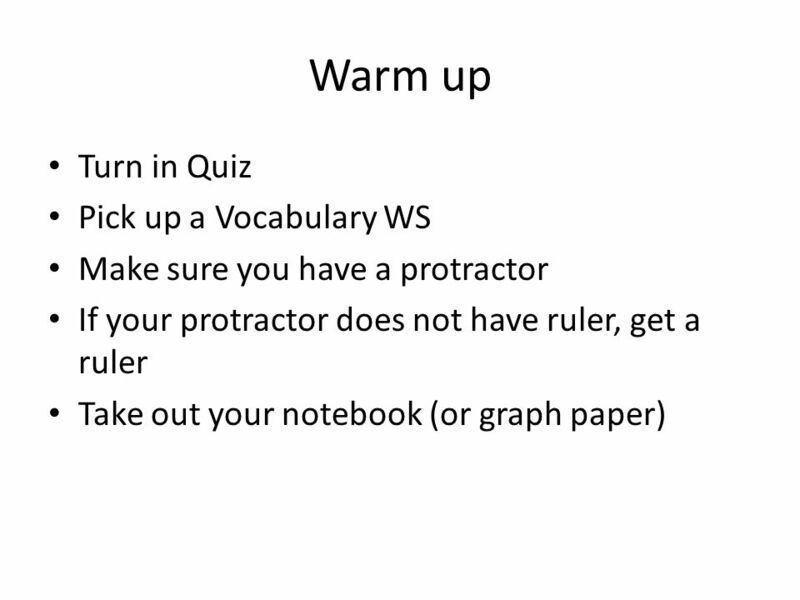 Download ppt "Warm up Turn in Quiz Pick up a Vocabulary WS Make sure you have a protractor If your protractor does not have ruler, get a ruler Take out your notebook." This presentation is the intellectual property of Christine Markstrum Chapter 7 Transformations. 1.7 What if it is Rotated? Pg. 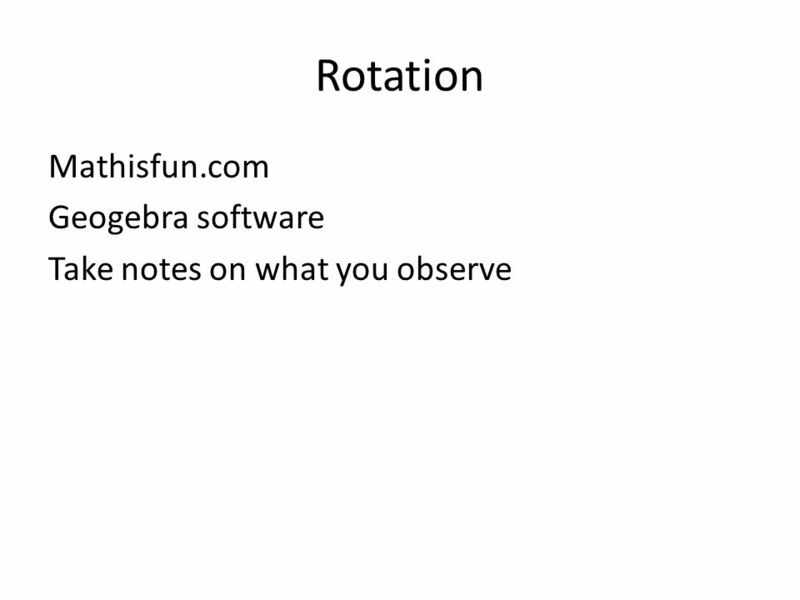 26 Rigid Transformations: Rotations. Warm Up A figure has vertices A, B, and C. After a transformation, the image of the figure has vertices A′, B′, and C′. Draw the pre-image and the image. & GUIDED QUESTIONS MATH VOCABULARY DAY 32. FIRST Table of Contents. EQ: How can you investigate transformations? 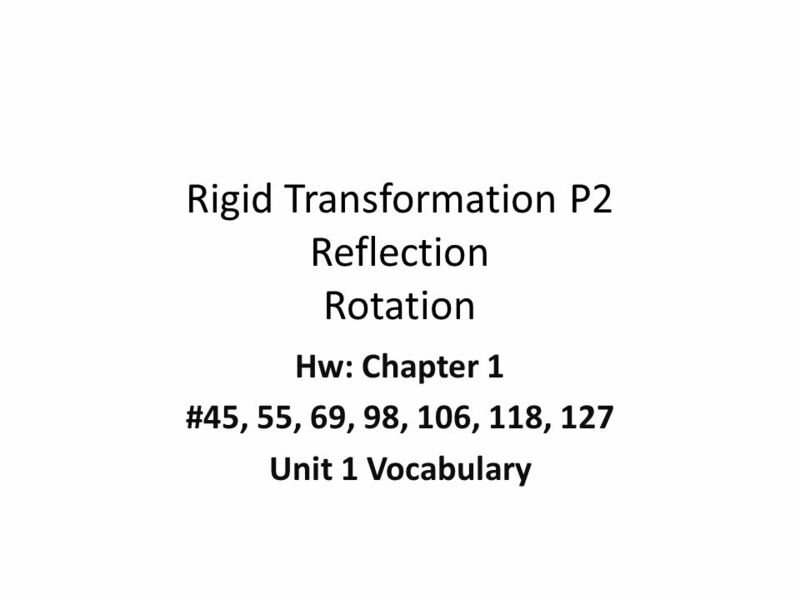 Lesson 13-5b Transformations pp Vocabulary to watch out for this lesson: Transformation Translation. 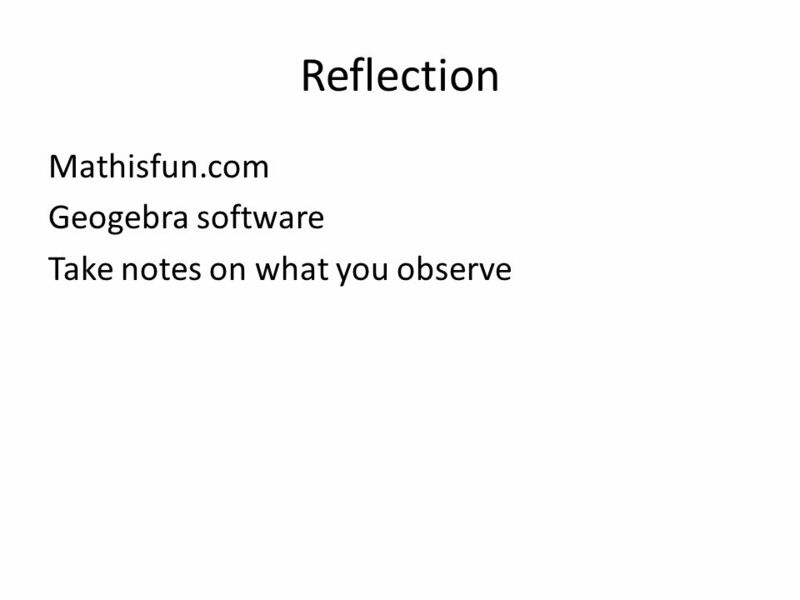 Linear Algebra MONDAY, AUGUST 11. 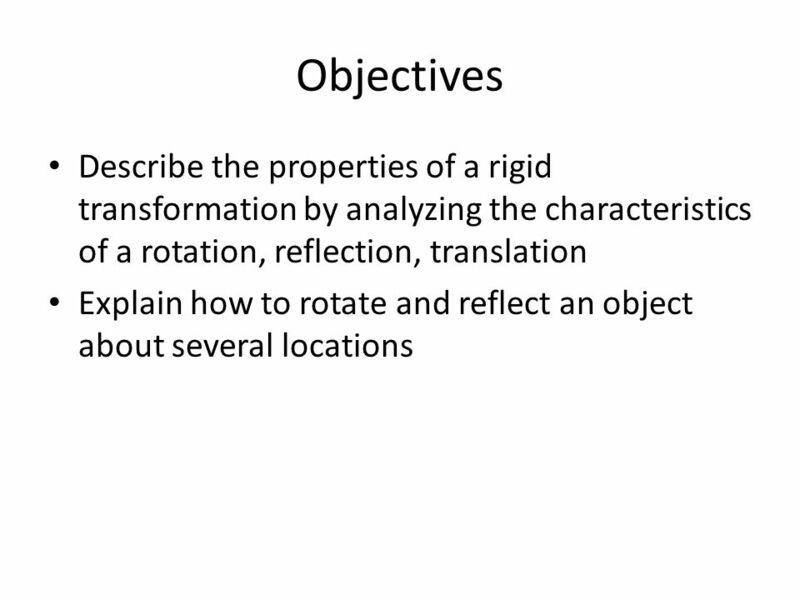 Learning Goal Focus 1  I will understand transformations and use informal arguments to prove congruency between images. Marie Quintano.  Target Audience: High School Geometry (9 th /10 th graders), any level  Goals: Visualize and create rigid motion transformations, while. Unit 5 Vocabulary The easiest thing to do is to plug in 1 and -1 (or 2 and -2) if you get the same y, then it’s Even. If you get the opposite y, then it’s. 1 Chapter 9 Transformations and Design. 2 Objectives of the Chapter  Relate transformations to symmetry and design in logos  Analyze the geometric aspects. Repeating Figures and Symmetries How can tessellations be made with repeating figures? What four types of symmetry do you look for in repeating figures?